Sebastien Loeb took his fourth stage victory of Dakar 2019, with a win in Stage 8 of the rally. The Frenchman, who drives for the PH Sport Peugeot team had a tricky day of rallying, given that Stage 8 was the "Super Ica" stage, where the top 10 across all categories were sent off first. This meant that Loeb was only allowed to start his stage over two hours later than his rivals, but he overcame all difficulties and ended up posting a strong time. He ended the 361km stage, that ran from San Juan de Marcona to Pisco, 7min and 27sec ahead of second-placed Nasser-Al Attiyah in the Toyota Gazoo SA Hilux. Third in the stage was Orlen X-Raid's Jakub Przygonski. 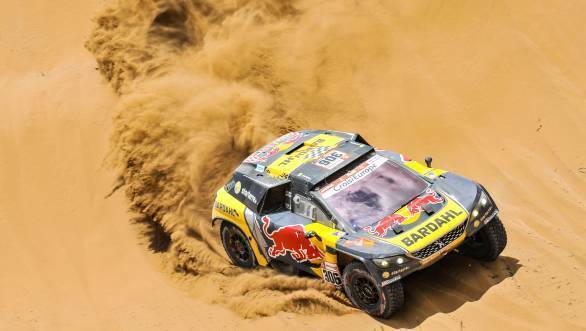 Stage 7 winner, Stephane Peterhansel, who had begun to challenge overall leader, Nasser Al-Attiyah, got stuck in the sand dunes twice, which meant his own hopes took a major hit. This means that second place overall now rests with Nani Roma. Loeb is currently ranked third overall. Disaster also struck X-Raid Mini Buggy drivers Cyril Despres and Carlos Sainz, both who got stuck in the sand. Toyota's Bernhard ten Brinke was forced out of the rally with engine issues. In the truck category, it was a major upset, with Dmitry Sotnikov taking overall lead after scoring his first stage win in the Dakar. 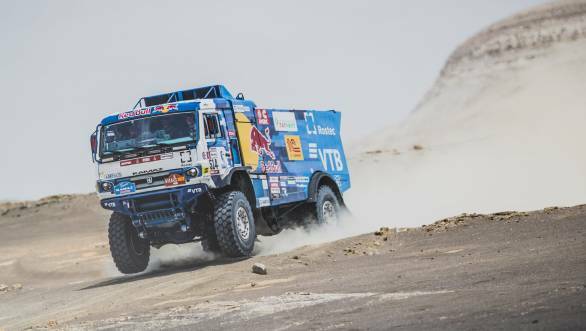 It was disaster for his Kamaz teammate Eduard Nikolaev who ended up stuck in the very same dunes that caught out Despres and Sainz. He conceded one hour to Sotnikov, and now trails behind him in second place. Iveco's Gerard de Rooy is currently ranked third overall in the truck category. In the SxS class, it was Chaleco Lopez who managed to rack up his third stage win in a row. This means that he now holds the overall lead, having taken over from Reinaldo Varela. 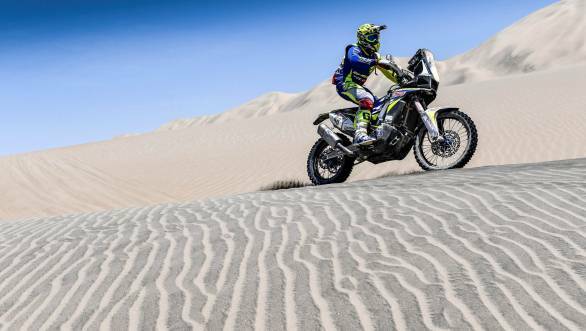 The drama in the 2019 Dakar certainly extended to the Moto category of the event. Overall leader Ricky Brabec retired from the rally with an engine failure just 56km into the stage. Victory in Stage 8 went to reigning Moto class champion Matthias Walkner, who was followed home by Pablo Quintanilla and Toby Price. In fact it was Price who rode almost heroically, leading nearly every waypoint, despite a broken wrist. 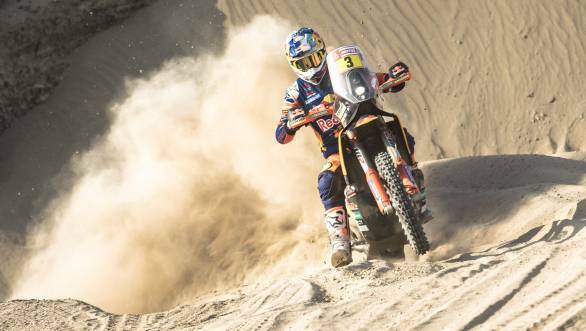 Although he was ultimately unable to win the stage, Price has moved into the overall lead of the 2019 Dakar. He is trailed by Quintanilla, 1min 03sec behind, and Walkner, 6min and 35sec behind. Another high profile retirement came in the form of Stefan Svitko, who crashed, and needed to be airlifted to a hospital for treatment. In the Quad category of the event, Nicolas Cavigliasso was victorious yet again, taking his seventh stage win of the 2019 Dakar. He continues in the overall lead of the Quad category. A strong performance from Indian rider KP Aravind saw him end Stage 8 of the Dakar 39th, also putting him 39th overall in the Moto class of Dakar 2019. His teammates Michael Metge and Adrien Metge are currently 24th and 26th overall.